The first edition of African Climate Week was held from March 17 to 22, 2019 in Accra, Ghana. Among the proposals for better implementation of national climate plans, the emphasis is on facilitating access to international financing, in order to complement national financing to reduce carbon emissions on the African continent. Ghanaian President Nana Akufo-Addo is candid about the financial difficulties he and his African peers are facing. 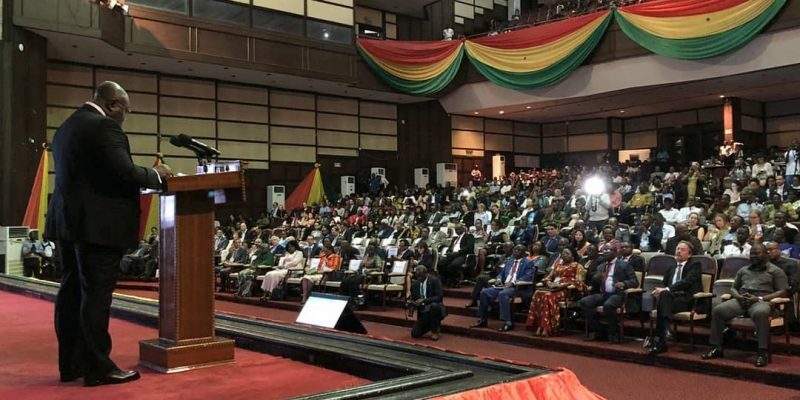 During the first African Climate Week, held from March 17-22, 2019, in Accra, the capital of Ghana, Nana Akufo-Addo called for streamlining access to international climate finance. A necessity for almost all developing countries. Indeed, this international support would complement national financing to reduce carbon emissions on the African continent. “We need to find practical and beneficial financial solutions for us in Africa. Your solutions must match the aspirations of our people and contribute to putting the world on a sustainable development path,” said Akufo-Addo, in the presence of UN Deputy Executive Secretary Climate Change, Ovais Sarmad, and COP24 Chairperson, Michał Kurtyka. The Ghanaian president said so during the high-level segment, scheduled for the third day of the event. A discussion in which the countries represented explained the gap between their respective governments’ current commitments to climate action and the long-term objective of the Paris Agreement to limit the average increase in global temperature to a level as close as possible to 1.5°C. On Ghana’s National Defined Contributions (NDC), President Nana Akufo-Addo referred to the One-District-One-Factory (1D1F) project, which is one of the government’s initiatives to stimulate industrialisation, rural development and strengthening Ghana’s resilience to the effects of climate change. “The strategic objective of the 1D1F initiative in the northern regions is to provide year-round access to water for smallholder farmers so that they have alternative livelihoods in practice during the dry season,” explained Nana Akufo-Addo. In 2017, the Ghanaian government launched a plan to reforest 10 million trees. The project to mitigate the negative effects of climate change involves 20,000 young people across Ghana. African Climate Week is an opportunity for countries on the black continent to work together to step up their efforts to combat climate change and to fulfil their obligations under the Paris Agreement. The results of these meetings will be an essential contribution to the United Nations Climate Action Summit, which António Guterres will host in September 2019 and whose objective is to help governments and non-state actors to raise their climate ambitions.